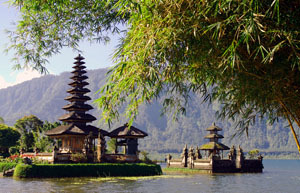 Capital of Bali Province in Indonesia, Denpasar has around 500,000 inhabitants. The warm and welcoming smiles from its inhabitants, the beautiful beaches, the surfing and diving spots, all make it an increasingly popular destination for tourists. You will enjoy exploring the city bazaars, strolling in the night market with its unforgettable atmosphere, and seeing the Balinese dancers. The main shopping street, Jalan Sulawesi, boasts numerous shops and boutiques selling jewellery, material, clothing, basketwork and wooden sculptures among other things. Visits are recommended to the Negeri Propensi Ethnographical Museum, the Asiatic Arts Gallery, and the different temples. Regarding the food, do try the delicious local specialities. From Denpasar you can leave on excursions to Mont Batur, or go up to the village of Sidemen which is encircled by rice paddies, these two sites offer unbelievable landscape views. If you visit Denpasar in July / August you will be able to enjoy the wonders of the Kite Festival.